What do the images on the homepage mean? The Holy See flag is to show that LPCA is faithful to Rome. To tell the world that LPCA is faithful to the Pope. The papal emblem is placed on the left side to represent Roman Rite (Western) Catholicism. The papal emblem also tells the world that LPCA appreciates the beauty of Roman Rite Catholicism. It shows the universality of the Church by showing the bishops of the world gathering together with the Pope. It reminds all of the necessity in praying for the continued holiness of the clergy. 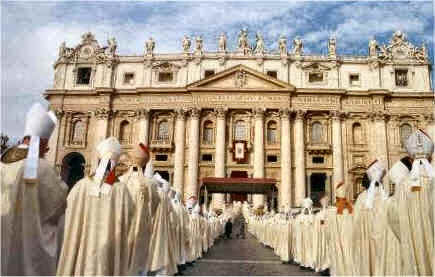 It reiterates the importance of being obedient to the Pope and to the bishops in union with him. The short prayer "My Jesus, Mercy", was selected to remind all to pray to Jesus, and to ask Him to grant us His Divine Mercy for the times when we are not holy. The placement of the cross on the right represents Eastern Rite Catholicism. The cross shows LPCA's devotion to the crucifixion. By using a devotion from Eastern Rite Catholicism on the homepage, LPCA is telling the world that it appreciates the beauty of Eastern Rite Catholicism. The recording of "Kyrie Eleison"
The recording of "Kyrie Eleison" was selected to remind all that we are sinners in need of Jesus' Divine Mercy.